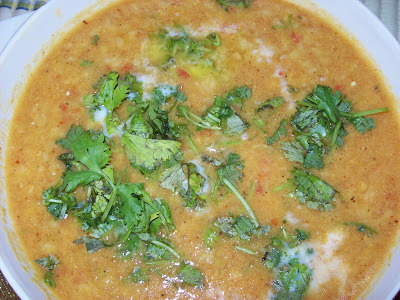 A tasty combination of four dals.It is one of our favorite dal in our home. 1.Wash all the dals together. 2.Add 4 teacups of water and cook until done in a pressure cooker. ginger and coriander leaves into a smooth paste and keep aside. 4. Heat the oil or ghee and fry the onions till light pink in color. 5..Add the paste, mix well with the onions and cook for 3-4 minutes. 6 Add tomatoes and mix well and cook for 5 minutes so that the tomatoes are done. 7. Add the cooked dals and salt to taste; stir the ingredients together. 8. Cook for 5 more minutes and , garnish with coriander leaves and serve hot.with rice, chapatis. the dal looks really good. i too make this pretty often.